REDDING, Calif. – During the 16 months that Mount Shasta resident Monica Mais was earning her Bachelor of Science in Nursing degree from Simpson University's ASPIRE program, she worked as a full-time nurse at Mercy Medical Center in Redding, taught classes as an adjunct clinical instructor at College of the Siskiyous, and earned her 100 clinical hours needed to obtain her public health certificate at the end of the program. The 39-year-old mother of four was among 133 graduates at Simpson's winter commencement on Jan. 22, including 103 from the Adult Studies (ASPIRE) program. Mais had been out of school for over 10 years before enrolling at Simpson. 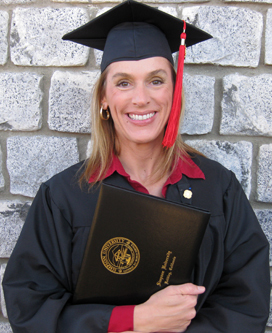 Her husband, Jay, who had recently earned an associate degree in nursing, and her desire to advance her career motivated her to finish her degree. "The ASPIRE program was great, and the work load was manageable," said Mais. "With classes only one night a week, I didn't have to relocate, and I could continue working full-time." Mais, whose two youngest children still live at home, found time in her busy schedule for homework and studying after her kids went to bed in the evenings. "My 10-year-old step daughter understands how important education is now," said Mais. "She was so impressed when we went to pick up my cap and gown. My older daughter is in college, and I hope that seeing her mom graduate will inspire her to continue with her schooling." With smaller class sizes in the ASPIRE program, Mais said that students in the program grew close to each other. "We're all in contact with one another, and it's exciting to see everyone graduate and move forward in their careers," said Mais. "I've developed a lot of professional relationships that will continue for years." Since completing the BSN program at Simpson, Mais was promoted at College of the Siskiyous to a permanent adjunct clinical instructor. She will begin an online master's program at Western University of Health Sciences in September to pursue a master's in nursing with a nurse practitioner certification. "I'm invested in staying in Siskiyou County and serving the needs of those in my community. This is a way for me to give back to the community," she said.